Photo by Javin Lau from the Torontoist Flickr Pool. Toronto property taxes are too damn low. That might go against the very convenient political consensus, but it happens to be true. Toronto goes through an annual debate about property taxes in which a significant majority of councillors will not consider raising revenue more than inflation. Left-wing politicians wind up being the fiscally responsible councillors in this discussion, and they point out that Toronto has continually raised property taxes lower than inflation, and say failing to meet the city’s growth rate creates a backlog of infrastructure needs. Then, the majority council essentially votes not to think about those problems. It’s a proud tradition. Recently, more attention has been paid to the things cost money argument, both because as needs pile up it’s increasingly obvious, and City Manager Peter Wallace has taken the lead on telling council to get their act together. The Toronto Star‘s Jennifer Pagliaro synthesizes various angles in Toronto’s 2017 budget debate in a really excellent article. If you have a basic understanding of the City budget but want to know the nuances better, then you should read it. Some online commenters have taken issue with one part of it, and they’ve argued that property taxes are way too high, or the way property taxes are represented is unfair. 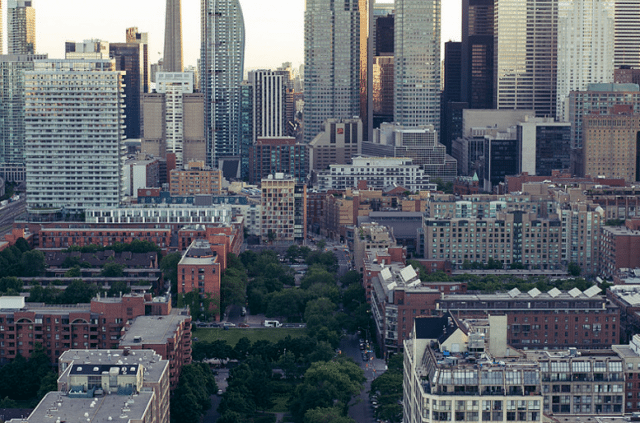 No matter how you look at the issue, Toronto property taxes are low compared to other cities. The Star article states that Toronto property tax rates are the lowest in the province. This is true. Toronto’s 2016 tax rate was 0.72 per cent, whereas Oshawa’s was more than twice that—1.56 per cent. If you want to compare Toronto to a larger city than Oshawa, Hamilton is at 1.38 per cent. Ottawa is 1.08 per cent. Those are substantial differences. But property tax rates, one can argue, are not the best way to look at the tax class. The immediate response is that this is because property values vary significantly in different municipalities, and higher values drives the rate down. This is true, but there are many GTA municipalities that now enjoy higher average property values than Toronto. That’s not the main reason why property tax rates aren’t the best measure. Instead, it’s because property taxes are not a rate-based tax. Property taxes are really weird, and they don’t work like the income tax or a sales tax. We have a whole lengthy explainer on the subject for you. It’s wonky and wonderful. So if you want to make the argument that although Toronto’s property tax rates are the lowest in the province, that’s not the relevant point of comparison—that seems fair. But if you compare property taxes on an absolute basis (that is, the average amount paid by household), Torontonians still get a great deal relative to their southern Ontario peers. The average Toronto household paid $3,625 in annual property taxes in 2015. We can already hear the objections: “But what about the Municipal Land Transfer Tax and water and waste-based budgets!” But those numbers are already included in the total, so it provides an apples to apples comparison to other cities. Only three southern Ontario municipalities pay less in property taxes: Milton, Georgina, and Burlington. Twenty-one pay more. That’s led by King, where the average household pays a whopping $6,100. The average Richmond Hill household pays $1,300 more than the average Toronto household. Newmarket represents the average amount, and their residents pay $600 more on average. Put another way, it would take a 24 per cent residential property tax revenue increase for Toronto to reach the average of its peers. You might also object that the measure should be about affordability, as Toronto has lots of low-income residents that other municipalities do not. Fair enough—Toronto does well on this metric too, as property taxes represent 3.3 per cent of household income compared to a 3.7 per cent average in the region. You could also say that Toronto’s property taxes are more affordable because of its density, and that it becomes cheaper to deliver services this way. That’s true: here’s guessing the marginal value is probably on the small side (and would require another article). But as a dense city, Toronto also delivers unprofitable services on a scale that others do not—most notably the TTC and social housing. It is not a coincidence that Toronto’s $91 million budget deficit is mostly driven by funding gaps in—you guessed it!—the TTC and social housing. Toronto property taxes are low compared to other cities whether you look at the tax rate, affordability, or absolute amount. Toronto’s funding gap comes because the City is trying to get away with the low taxes of say, Georgina, while it needs to provide the service levels of the fourth-largest city in North America. The city really needs to get its head around this—Mel Lastman may have committed amalgamated Toronto’s original sin by winning office on a pledge not to raise property taxes at all in his first term, despite the downloaded costs. The pitch was that we could have Old Toronto services at North York prices, and the math doesn’t add up. Toronto property taxes are too damn low no matter how you look at them. You can quibble with how they get represented, but you can’t escape that basic truth.